I've had this original Lladro Pinocchio piece for many years. I bought mine in Barcelona, Spain. 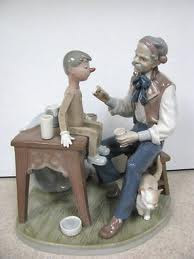 LLADRO "The Puppet Painter" RARE & Hard to find! Highest Quality and Best Price, HURRY wont' last make an offer NOW! Glazed finish / 9½x8¾ " Nice size beautiful and detailed.